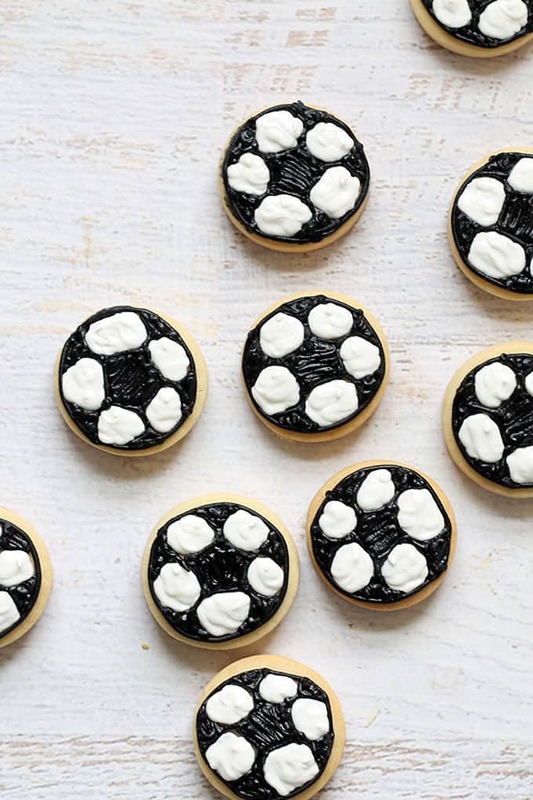 Soccer ball cookies, little decorated cookie bites for your athletes. Ever try and pipe or draw a soccer ball? 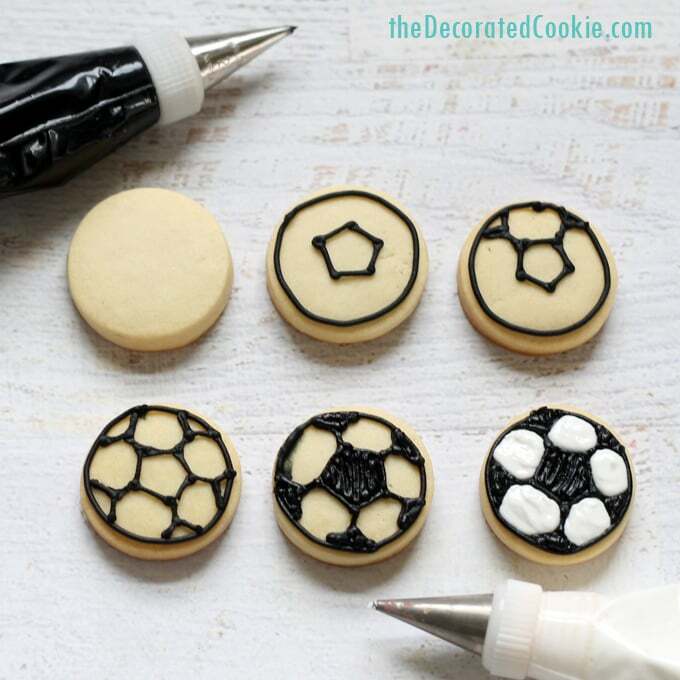 Or make soccer ball cookies? It’s tricky, huh? 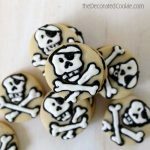 I remember many moons ago, working as a cookie decorator, the day we finally figured out the secret to drawing the pattern. You see, the black sections are pentagons and the white sections are hexagons. That’s it. So draw a pentagon in the center. From each of the five points, extend a line. At the end of those lines are more pentagons. Drawing the pentagons and lines will magically create the white hexagons. Don’t worry, I have a visual below if this explanation sounds wonky. 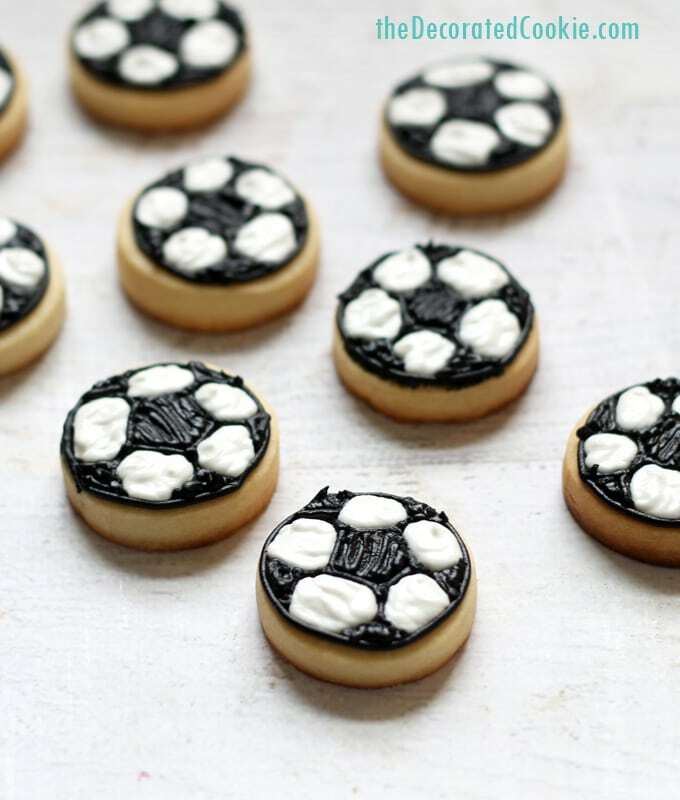 I made these li’l soccer ball cookie bites for my soccer playing niece who just turned double digits. These are small cookies, only 1 1/2 inches across, but you can choose any size circle cutter you like. *For tips on finding supplies, click HERE or see below. For food coloring, I suggest Americolor Soft Gel Pastes in Super Black and Bright White. 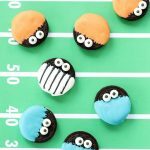 For basic cookie decorating how-tos, click HERE. what to do: Prepare your cookie dough, chill it, roll it out and cut out your shapes. Bake and let cool. Prepare your royal icing, divide it and tint black and white. Prepare two decorating bags with couplers and tips, fill with each color and close tightly with a rubber band. To decorate the soccer ball, pipe a black circle. In the center of the circle, pipe a pentagon with black. Pipe a line from each of the five points of the pentagon, and at the end of the lines, pipe the tops of triangles (in theory, these are also each pentagons, but they disappear off the edge of the circle). Pipe to fill in the pentagons and triangles. 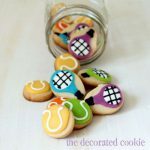 Fill in the other shapes with white icing. Let the cookies dry well, preferably overnight.